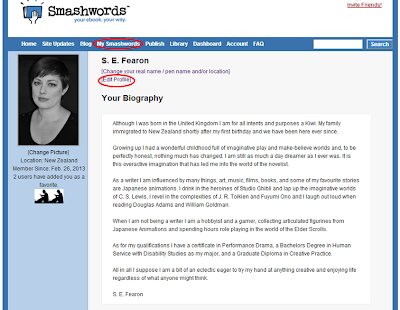 Smashwords is one of the leading suppliers of independently published eBooks therefore I highly recommend making your eBook available through them. 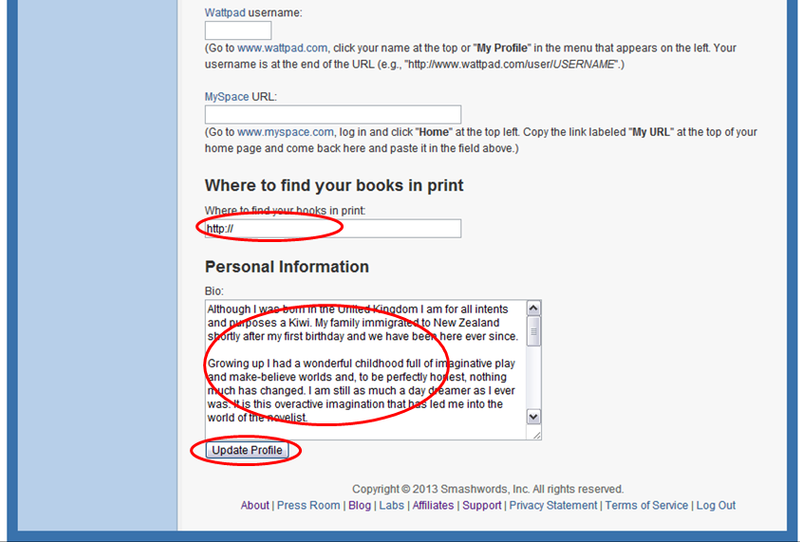 Once you have signed in you want to click on publish, located on the main navigation bar. 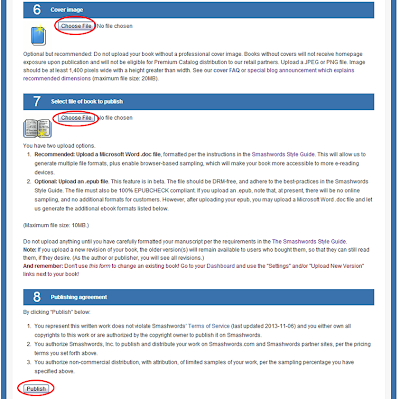 This will take you to a new page where you will be taken through an eight step process. Step One: Title and synopsis, first you want to enter your book name and select whether you want to immediately release your book or make it a preorder and schedule a later release date. Then you want to enter your synopsis in both a short version and a longer version. 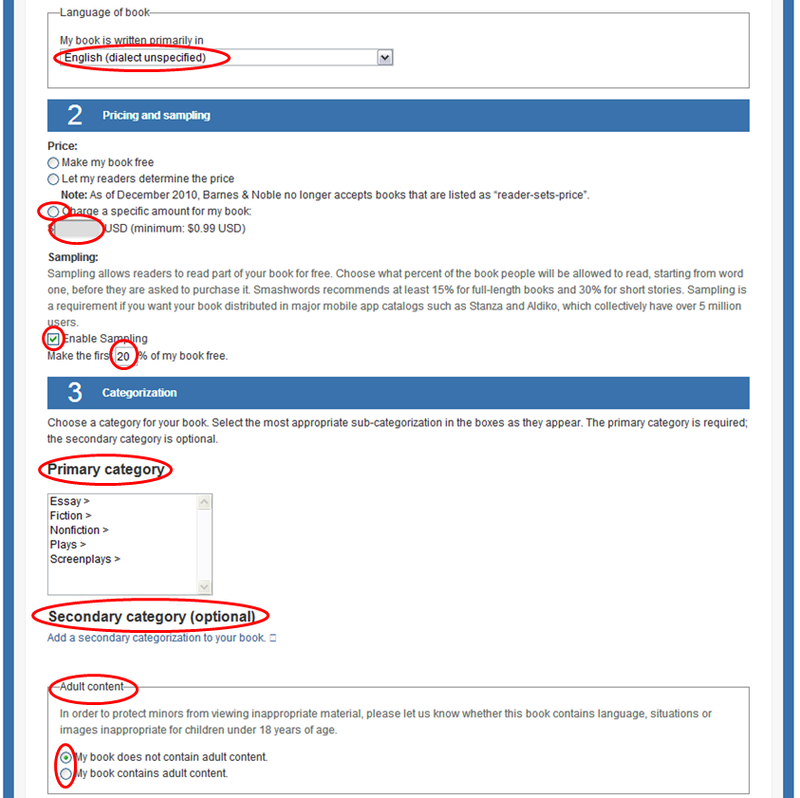 Next you want to select the major language of your book. Step Two: Pricing and sampling, here you have the choice to make your book available for free, let the readers determine the price or set your own price. For a new and unknown author 2.99 USD is a reasonable price and it is a price which has proven to sell well. 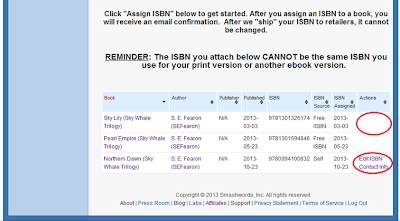 You can also enable sampling of your book, which I recommend, and the default is 20% of the book. 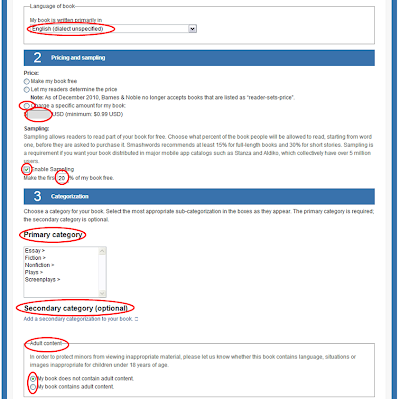 Step Three: Categorization, here you want to select the categories you wish your book to appear under. 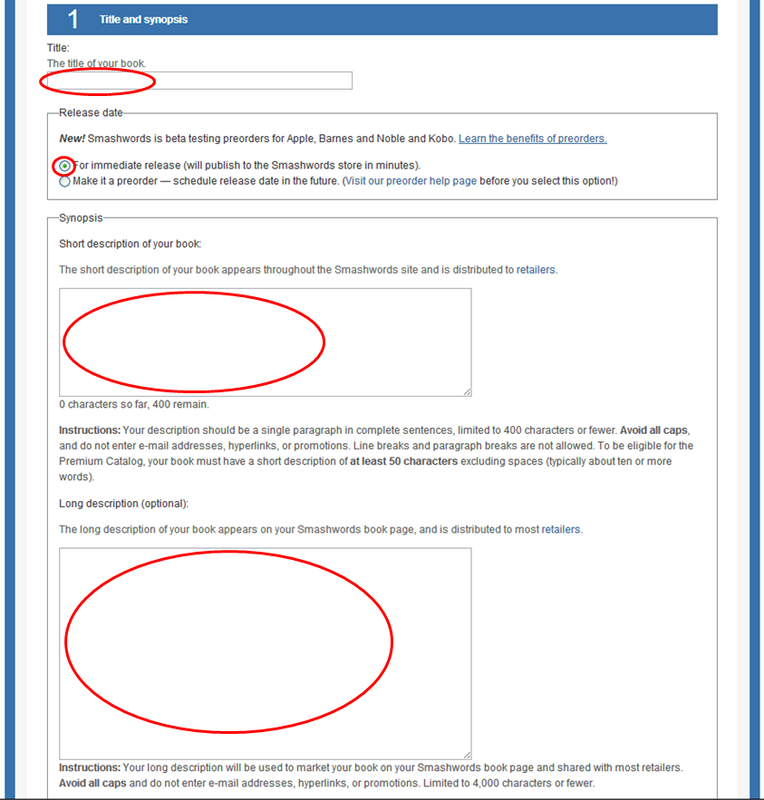 You must choose a primary category and you have the choice of adding a secondary category. Finally you want to indicate whether or not your book contains adult content. 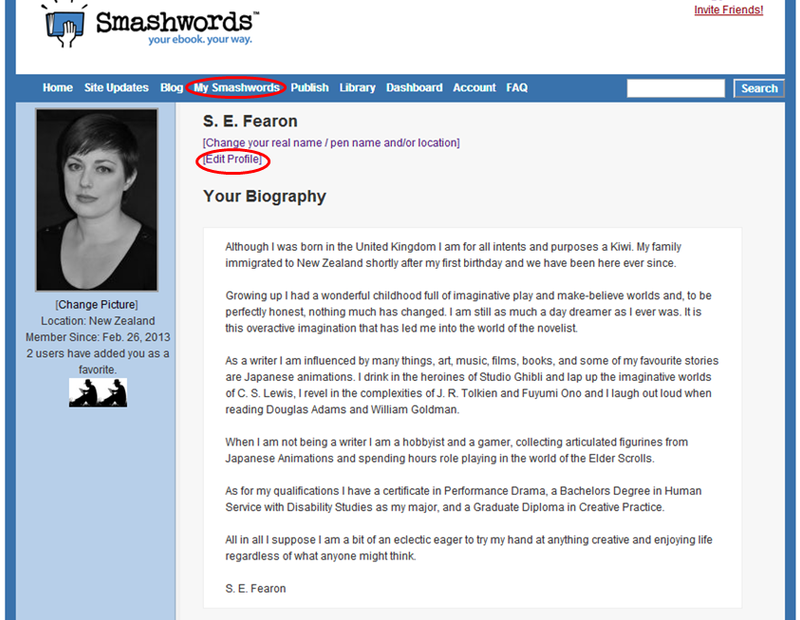 Step Four: Tags, here you want to enter keywords which will help readers find your book. 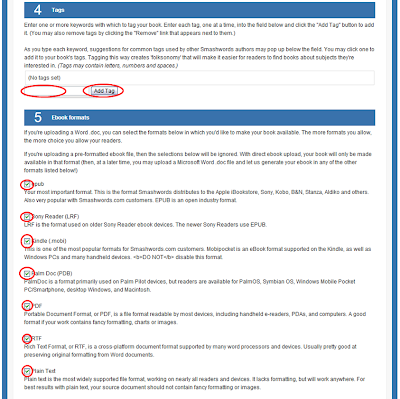 Step Five: Ebook formats, in this step you are asked to select which formats you wish your eBook to be available in, I recommend selecting all as if gives your readers the option to have a version for each of their devices. 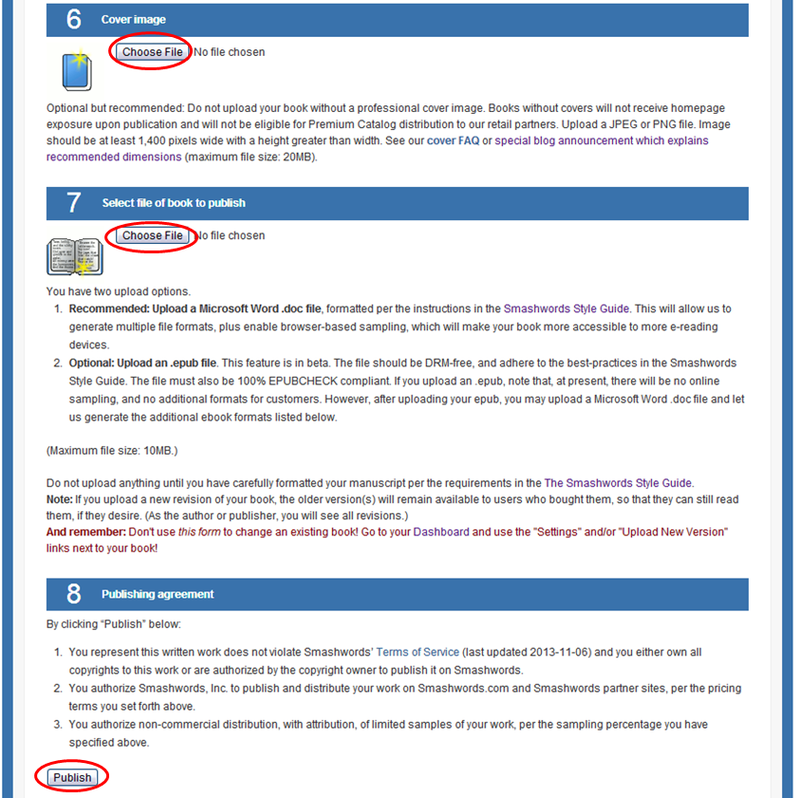 Step Eight: Publishing agreement, the final step is to read through the publishing agreement and then click publish. 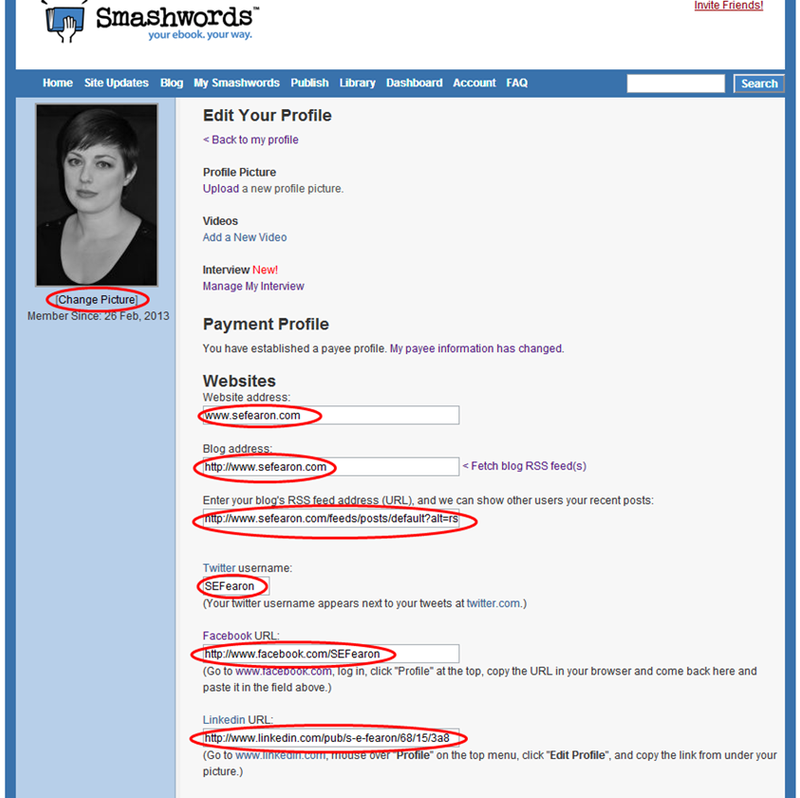 Now that your book is published there are a few things to do in your dashboard. 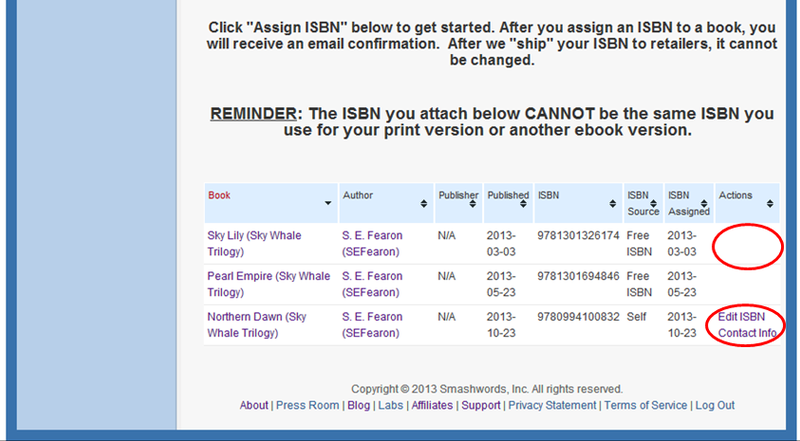 First you want to go to your ISBN manager and on the new page scrolls down. 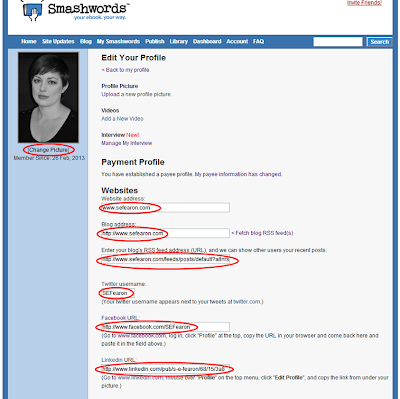 You are given the option under actions to assign an ISBN number to your book, now if you don’t have your own ISBN there is the option of having smashwords assign you one. Next if your book is part of a series you want to go to your series manager. 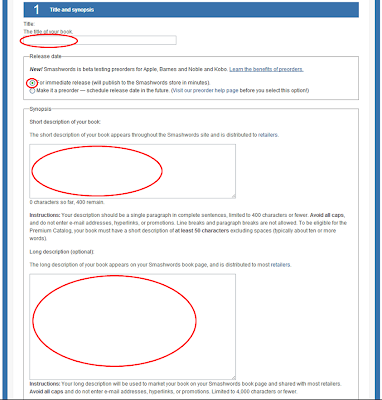 On the new page you want to click create a new series which will open a new page where you enter the name of your series, then click create series. When the page reloads you want to select the books featured in that series then click add books. Next you want to go to your pricing manager and scroll down to the bottom of the page, here you can review the prices of your books and I recommend that under price to libraries you select make my book free, then click save changes. 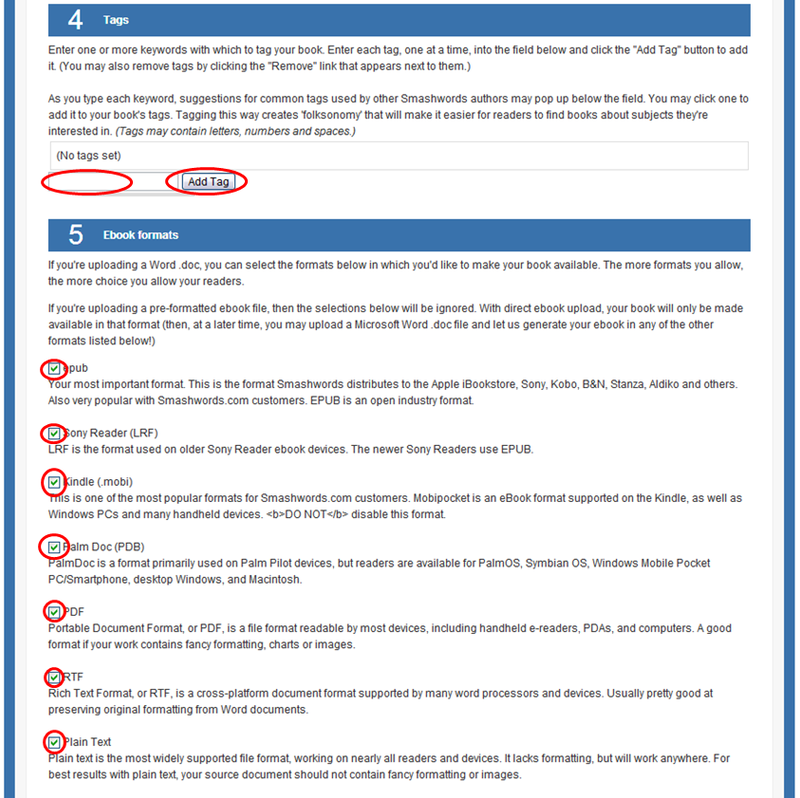 After this head to your channel manager and scroll down, here you can determine what partners receive a copy of your book. If you have published separately through Amazon, Kobo, or any other major eBook supplier I recommend selecting opt out so that you do not get double ups. 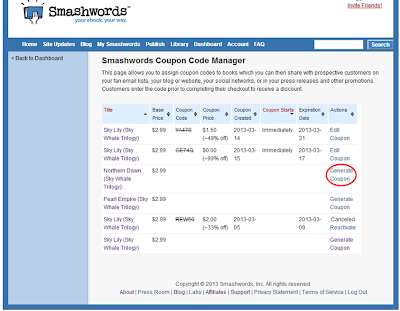 One more thing you may like to do before your head over to set up your author profile is to create a discount coupon for your book, simply click on coupon manager. 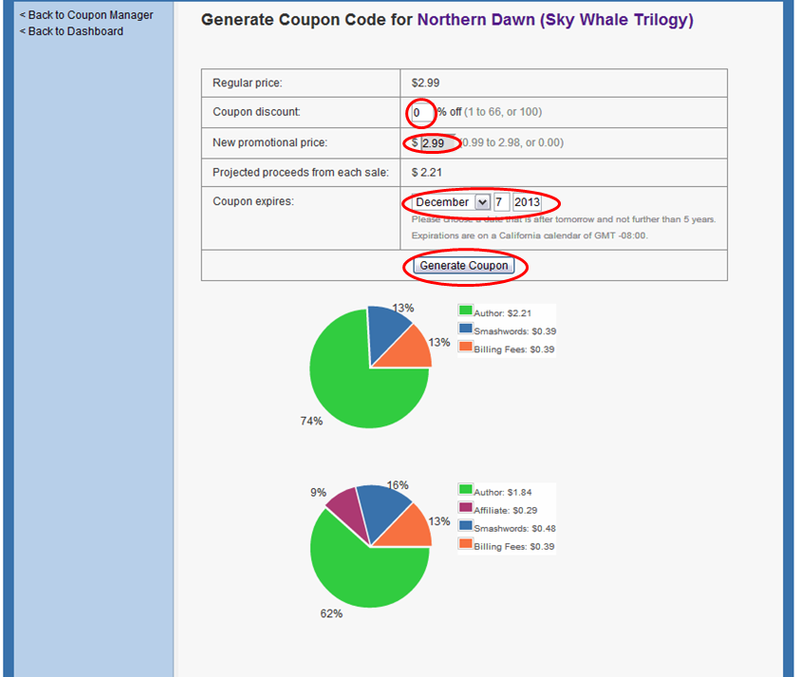 Here you can generate new coupons, edit existing coupons, or reactivate canceled coupons. When you click on generate coupon you will be given the option to set a percentage and bellow it will then show you what the new promotional price shall be. 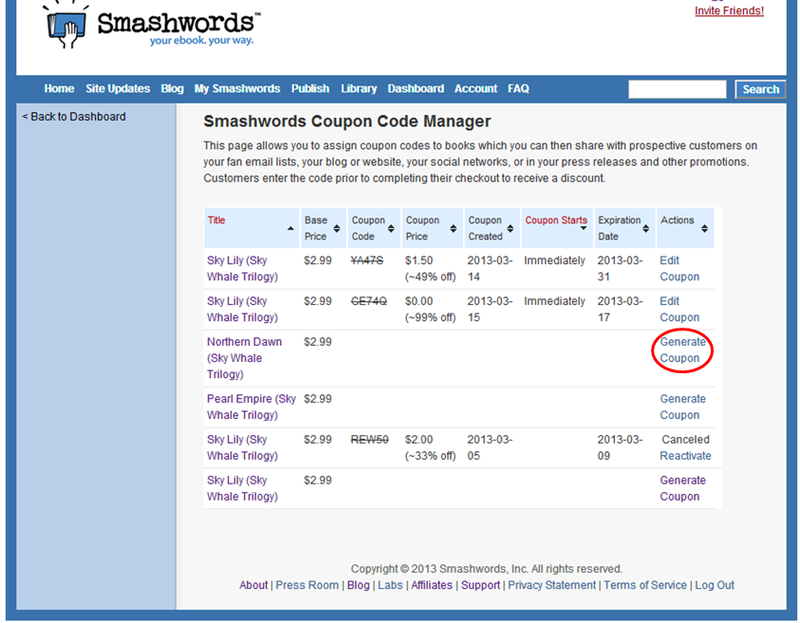 You then need to select an expiration date before you generate the coupon. 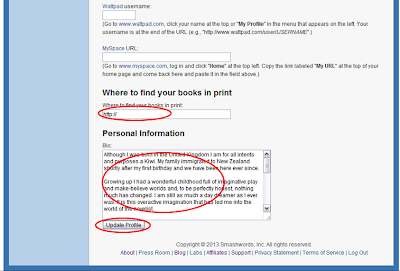 After all the book information is sorted you should click my smashwords on the main navigation bar, this will take you to your author profile which you will want to edit. Here you can upload your photo, link your website, blog feed, Twitter, Facebook, and your Linkedin profile. If your books are available in print you can link the URL of the site they are sold on and finally you want to enter your biography.